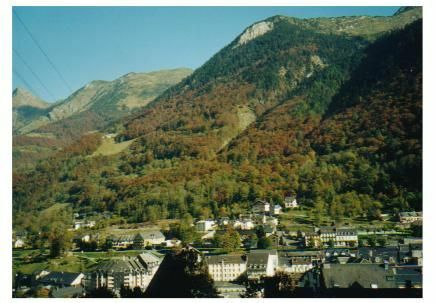 Flat 2 rooms, bright directed full South Southeast with panoramic view on the village and has mountain. 4 places. Arranged to have a real living room separated from the sleeping area. Located on the 1st floor of a quiet and modern building with no elevator. Near the city center, baths and cable car. Exposure kitchen diner Southeast corner with views overlooking the village and mountains. Sleeping area with bed 140, bed 90 bridge, 90 bed, new bedding and good quality. equipped with every comfort. Private, private ski lockers at + local public bicycle parking. Discounted rates according to length of stay, see conditions with the owner. DEPOSIT: 153 € CHECK TO GET THE DAY OF ARRIVAL IN THE ACCOMMODATION. Refund at the latest within 15 days. Package cure 550 € for 3 weeks in low season. Other pool activities, alpine skiing, cross country skiing, snowshoeing, spa with fitness center, ice rink, cinema, casino, excursions, cures. Equipment comfort: hot plates, microwave, refrigerator, dishwasher, grill, vacuum cleaner, iron. Washing Up. blankets, pillows, bolsters. 1 small baby bed with mattress, 1 child booster Disposable mattress pad provided. Free shuttles to the provisions of skiers several times a day during school down the street from the apartment to the gondola. schedules to see the tourist office. Just 300m from the town center and the town hall; 400m walk from the ski cabins.